Because of there high cost they are normally used by Gnomes and/or Game Hunters. After combining this pistol with a scope and occanisally a bipod these pistols have a satisfyingly long range. This pistol has no sights, it comes predrilled and tapped for a scope. This pistol has no sights, it comes predrilled and tapped for a scope. Seen below with scope and bipod. The origional high power lever action rifle. Known to some pepole as a heavy brush gun (because it can shoot through most trees) is a favorite with most big game hunters. This high power lever action rifle is a favorite with most big game hunters. Due to it's smaller size, lighter weight (than 1886), and it's very responsive lever action. New from Scattergun Technologies this beauty leaves the assemblly line with a Extended Mag. tube, pistol grip stock, & Surefire TacLight forend. New from Scattergun Technologies this beauty leaves the assemblly line with a Extended Mag. tube, Speed-Feed stock, Ghost Ring sights, & bayonet lug. New from Scattergun Technologies this beauty leaves the assemblly line with a pistol grip, and a 18" vented bbl. New from Scattergun Technologies this beauty leaves the assemblly line with a 3-shot w/ folding forward grip & pistol grip. New from Scattergun Technologies this beauty leaves the assemblly line with a 12.5" bbl., matte blue finish, witness protection style stock and forend, all this and it on a "Police Magnum" receiver frame. New from Scattergun Technologies this beauty leaves the assemblly line with a 12.5" bbl., matte blue finish, with a Choate Mk 6 synthetic stock (with shell holders) and forend, all this and it on a "Police Magnum" receiver frame. 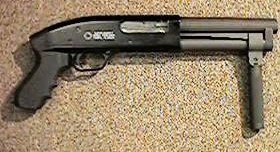 This is a highly modified Remington Model 1187P Magnum Shotgun. It comes Complete with a rifled barrel, Scout-Optics scope, extended magazine tube, Side-Saddle shell carrier (holds 6), synthetic buttstock & fore grip, and a tactical sling. The weapon is covered in a non-reflective matt finish. Use of anything other than slugs will damage the barrel, making it useless.